Kurdish (Kurdî, کوردی; pronounced [ˈkuɾdiː]) is a continuum of Northwestern Iranian languages spoken by the Kurds in Western Asia. 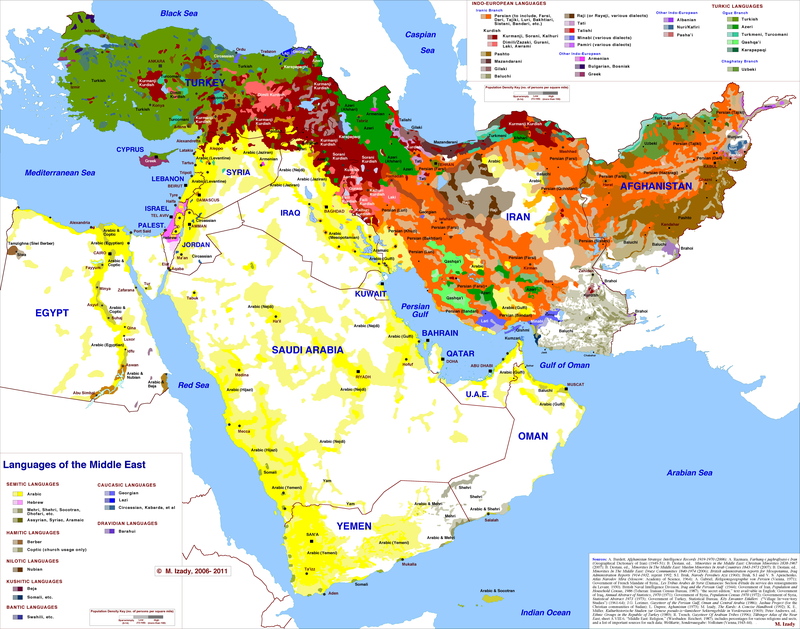 Kurdish forms three dialect groups known as Northern Kurdish (Kurmanji), Central Kurdish (Sorani), and Southern Kurdish (Palewani). A separate group of non-Kurdish Northwestern Iranian languages, the Zaza–Gorani languages, are also spoken by several million Kurds. Studies as of 2009 estimate between 8 and 20 million native Kurdish speakers in Turkey. The majority of the Kurds speak Northern Kurdish ("Kurmanji"). ↑ "Ethnologue - Azerbaijan". Archived from the original on 23 January 2018. Retrieved 3 February 2018. ↑ Hammarström, Harald; Forkel, Robert; Haspelmath, Martin, eds. (2017). "Kurdish". Glottolog 3.0. Jena, Germany: Max Planck Institute for the Science of Human History. 1 2 "Archived copy" (PDF). Archived (PDF) from the original on 20 August 2011. Retrieved 23 December 2011. ↑ "Kurmanji". Archived from the original on 4 March 2016. Retrieved 24 February 2016. ↑ "Kurmanji Kurdish" (PDF). Archived (PDF) from the original on 4 March 2016. Retrieved 24 February 2016. ↑ "Kurdish language issue and a divisive approach - Kurdish Academy of Language". Archived from the original on 17 October 2015. ↑ Bruinessen, M.M. van. (1994). Kurdish nationalism and competing ethnic loyalties Archived 12 November 2011 at the Wayback Machine. ↑ Paul, Ludwig (2008). "Kurdish language I. History of the Kurdish language". In Yarshater, Ehsan. Encyclopædia Iranica. London and New York: Routledge. Archived from the original on 4 December 2011. Retrieved 28 August 2013. ↑ Frye, Richard N. (1984). Handbuch der Altertumswissenschaft: Alter Orient-Griechische Geschichte-Römische Geschichte. Band III,7: The History of Ancient Iran. C.H.Beck. p. 29. ISBN 9783406093975. ↑ Hassanpour, A. (1992). Nationalism and language in Kurdistan. San Francisco: Mellon Press. Also mentioned in: kurdishacademy.org Archived 9 July 2016 at the Wayback Machine. ↑ "BACKGROUND TO THE LANGUAGE, COMMUNITY, AND FIELDWORK 1.1 Introduction The present work is a grammatical description of the Mukri variety of Central". www.dissertation.xlibx.info. Archived from the original on 2017-03-05. ↑ "Archived copy" (PDF). Archived from the original (PDF) on 15 October 2015. Retrieved 15 October 2015. ↑ Opengin, Ergin; Haig, Geoffrey. "Kurdish: a critical research overview". Academia.edu. ↑ Leezenberg, M. (15 June 2016). Soviet Kurdology and Kurdish Orientalism. researchgate.net. p. 10. Archived from the original on 27 April 2018. Retrieved 24 November 2017. ↑ Repression of Kurds in Syria is widespread Archived 15 October 2007 at the Wayback Machine., Amnesty International Report, March 2005. ↑ "After 52-year ban, Syrian Kurds now taught Kurdish in schools". 6 November 2015. Archived from the original on 10 May 2016. ↑ "Special Focus Cases: Leyla Zana, Prisoner of Conscience". Amnestyusa.org. Archived from the original on 10 May 2005. Retrieved 2 December 2011. ↑ "Kurdish performers banned, Appeal from International PEN". Freemuse.org. Archived from the original on 13 January 2012. Retrieved 2 December 2011. ↑ "Turkey to allow Kurdish lessons in schools". Aljazeera. 12 June 2012. Archived from the original on 13 March 2013. Retrieved 12 June 2013. ↑ "Neighboring Kurds Travel to Study in Iraq". Npr.org. 9 March 2005. Archived from the original on 26 January 2012. Retrieved 2 December 2011. ↑ "TRT HABER - Özel Kürtçe Kanala Yeşil Işık". Trt.net.tr. 28 November 2011. Archived from the original on 18 January 2012. Retrieved 2 December 2011. ↑ "On trial for speaking Kurdish". ANF-Firatnews. 11 May 2011. Archived from the original on 15 June 2013. Retrieved 12 June 2013. ↑ "Kurdish TV starts broadcasting in Turkey". Kurdmedia.com. Archived from the original on 12 January 2012. Retrieved 2 December 2011. ↑ ". Number of resident population by selected nationality, mother tongue in 2009" (PDF). Archived from the original (PDF) on 10 July 2012. Retrieved 9 April 2015. ↑ "The Kurdish Unified Alphabet". www.kurdishacademy.org. Archived from the original on 24 May 2011. Retrieved 2 December 2011. ↑ "The Gospels in Kurdish in Armenian characters, 1857, Constantinople". Google.com. 18 February 2010. Archived from the original on 5 July 2014. Retrieved 2 March 2014.